When evaluating the best podcast recording software to use, it is a good idea to try before you buy. Even if you’re a seasoned podcaster, trying some of the new tools available can be eye opening. As you plan, launch or improve your podcast, you’ll want to use the best possible tool for your situation. While most podcast recording and editing software produces high quality audio, ease of use and a good user interface can matter a lot in making the experience enjoyable. More and more advanced editing platforms are appearing. And by advanced I don’t mean more complex, but simpler to use, and designed to provide user experiences specifically around certain use cases. For example, some platforms are designed with story telling in mind. These focus on assembling lots of audio clips and conversation snippets. Think NPR type shows. Others focus on easy ways to edit out “ums” and “you knows”, and integration of transcriptions to text. So here is a list of podcast recording software tools with free trial periods. I’m also including some free tools in this list. Descript is an Audio Word Processing Platform. Let that sink in for a minute. Basically the idea is that you edit audio by editing text. What is Audio word processing, and how is it different from traditional podcast recording software? Basically, you edit audio by editing text. Descript transcribes your podcast, and then presents you with a text editor alongside a traditional audio track interface. The innovation is that if you edit the text, say removing an “um”, the changes appear on the audio track as well. For example, I am guilty of too many “you knows” in my podcast recordings. Descript makes it easy to find and replace all of my mistakes. Editing audio as intuitive as your favorite text editor. Cut, paste, copy and delete — remix your text, and your audio follows. Multitrack Transcription – The ability to upload multiple tracks from the same recording session. Descript then combine these tracks into one transcript. Automatic Speaker Labeling – Descript generates near-perfect speaker labels for multitrack recordings. Advanced Correction Tools – Workflow that adjusts to your own pace. The playback waits as you make corrections — then speeds up when you’re ready. Smart Editing – Often I need to arrange pauses or gaps between words. Descript can nudge words further apart — or closer together. What is smart in these editing features is that automatic crossfades ensure your edits always sound smooth, with no sudden stops or pops. Video Tools – Another innovation is not so much the fact that you can use Descript as a Transcript tool. It is that you can then export captions in SRT/VTT format, which means you can add captions to most online video hosting platforms. Human Powered Transcription Option – 99% accuracy, average turnaround in less than 24 hours, exportable as a document or captions with lots of timestamp options. Final Cut Pro Export –Now you can export a Project to Final Cut Pro – retaining all of the edits you made in Descript and using the original assets. The free version of Descript is perfect for occasional transcribers that don’t need to edit audio. It is 15¢ / min with no monthly fee. However you can try the Audio editing features in demo mode for 30 minutes of free transcription. This is ample “free” time to figure out if this platform is a good fit for your purposes. Podcasts are becoming more sophisticated. This is in part thanks to radio. Major stations like NPR have launched a number of amazing podcasts over the last few years, and this has resulted in a maturity shift. Great story telling podcasts like Serial, or the sorts of shows Gimlet Media is putting out, are raising the bar. In my view, the planning, assembly and recording techniques that go into story telling podcasts are a good example of how the industry has developed. So, it stands to reason that new tools are emerging to make these sorts of story telling projects easier to produce. One such tool is Hindenburg-Journalist. Hindenburg is great for recording interviews in the field. It even has an iPhone app by the same name, which means clips recorded in this app can easily be integrated into the editor. But it is in organizing clips and arranging a story line from them that Hindenburg is unique, with a feature they call their clipboard. This is where you can save major amounts of time. Using the clipboard to organize your material gives you a bird’s-eye view of your material: whom you talked to, what they said. Take the best sound bites from the interview and place them in a group. Add all the music and ambient sound you think you might need in separate groups. Now you can focus on the story itself. An automatic voice profiler applies optimized EQ set your ideal “on air” narration type profile. Automatic volume leveling is also a time saving innovation. This is applied in the background, again showcasing a focus on story telling assembly instead of technical geekery. I also like the fact that the platform can integrate with Libsyn SoundCloud for one-click publishing. Lastly, publishing process can apply broadcast ready loudness standards to LUF-16, something that requires manual work on other platforms, like the “Loudness Radar” feature in Adobe Audition. Skype recording is built in as well. There is a very generous 30 day trial you can apply for. If you go ahead after that period, I also like the fact that the platform does not require a subscription, but has a one time only price. Some podcasters just love the podcast audio editing process. I count myself among those. However, for other podcasters, the audio editing process is painful or just too time consuming. Alitu is an attempt at automating the episode production process. You upload an audio track, and Alitu does the rest, adding your standing intro and outro, and handling the ID3 tagging and publishing process. There is a one-time configuration process, where you upload your standing intros and outros as well as your branding. But after this step, Alitu can produce finished episodes according to these settings. I was on the Beta trial team for this software an enjoyed working with it. The software has evolved since then and is actively being developed. My chief complaint during the early versions was a lack of multi track support, and this has since then been added. Clean Up & Combine Recordings – We do a bit of processing and polishing to make sure your recordings sound great, and we can merge clips or stitch many of them together. Create & Add Your Branding – Use our ‘theme music maker’ to create your theme, quickly, easily, then we’ll add it to the start & end of your show. Download or Auto Publish – We create a perfect MP3 & add metadata. You then download, or publish directly to Libsyn, Blubrry, Podbean & Spreaker. Many more coming soon! Alitu has a 7 day trial period. Why are podcasters so obsessed with sound quality? Actually, I think it is because listeners are obsessed with sound quality. Listening to interviews that have poor audio quality is physically painful. There is real intimacy that comes from “having someone in your ear” for 30 minutes at a time. Recently I was listening to some marketing podcasts that were produced with horrible sound quality. BOTH the podcast host and the guest were recorded on what sounded like spotty 60’s phone lines, at different volumes, in a scratchy sort of way. It was just too annoying, even though I was enjoying the content I had to stop listening. And I’m not alone, most regular podcast listeners expect high audio quality. Zencastr is a podcast recording software all about delivering sound quality for interviews. The challenge of course is that podcast hosts often has an amazing microphone setup and sounds great, whereas their guest seems like they are in an entirely different space, audio wise. Zencastr solves this by recording separate tracks locally, for BOTH host and guest. A Separate Track Per Guest – Recording each voice locally leads to pristine quality. No dropouts, buffering or downsampling due to a bad wifi connection. Record in Lossless WAV – Zencastr records both hosts and guests in lossless 16-bit 44.1k WAV for the best possible audio quality. Soundboard for Live Editing – This can be a real time saver, and again illustrates how podcast specific software is evolving, as compared to a “professional” all purpose audio tool like Adobe Audition. The concept here is that you can insert your intro, ad, or other audio live as you record. This saves you time in post production. Built-in VoIP (Voice over IP) – o In a way, using a tool like Zencastr replaces Skype or Zoom for recording. You communicate with your guests via their VoIP stream, but the audio is recorded locally on both ends and later merged. Automatic Postproduction – I think the idea of automating postproduction is implemented as a single mixed track . But you can add curated audio enhancements. Cloud Drive Integration – Your recordings are delivered automatically to your Dropbox account for easy editing and sharing. Zencastr has a permanent free version of it’s podcast recording software. It has the following restrictions: Up to Two Guests, 8 Hours per Month, High Quality MP3, and a “Pay per use” postproduction mode. Innovation is in the eye of the beholder. Adobe Audition is a de-facto industry standard in podcast recording software, as well as in overall audio editing and production. It is “innovative” insofar as it is one of the most feature rich audio recording platforms available. But, it may be overkill for most podcasters wanting to skip the learning curve. And as I’ve written about above, my view is that bespoke podcast optimized platforms are emerging that actually reduce the feature set to the minimum. That said, we do use Adobe Audition to produce all of our client podcasts, and like it because you can find lots of 3rd party audio editors familiar with the platform. And as a beginning podcaster perhaps you owe it to yourself to check out a professional solution among the other choices. If only to see how it strikes you, and if you can use it to quickly become proficient in the production process. From a podcast specific point of view, Adobe’s interface can “hide” some of it’s more complex features by activating a “radio production” or “podcast production” view. 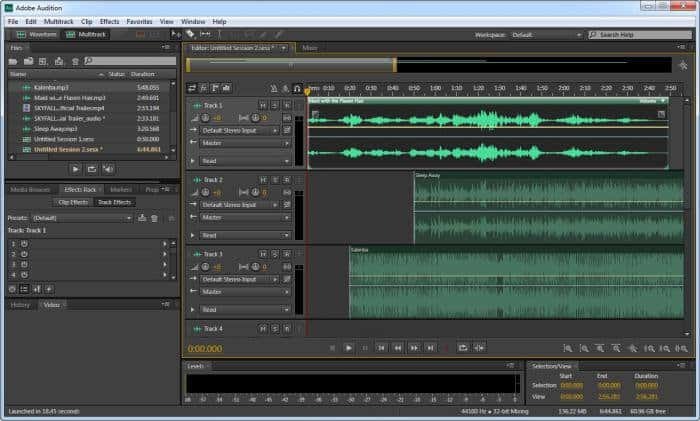 Adobe Audition offers a 7 day free trial period. There is no limitation of features during the trial period. beyond this, AA is offered as part of the Creative Cloud subscription, but there are also stand-alone ways to purchase it. What About Other “Obvious” Platforms? Am I not forgetting something? GarageBand – Garageband is free, and comes with the Mac platform. I feel it is positioned as a music recording toolset rather than podcast recording software. That said, it’s free, and it works. Personally I dislike the user interface and the skeuomorphic design approach. Audacity – Audacity has been one of the most popular free solutions available. Lots of podcasters use it, and there is no free trial since it is open source software. Apple Logic ProX – Apples pro upgrade to Garage Band. Another powerful and pro level recording platform, but geared towards complex music production needs rather than being optimized for podcasting. Reaper– Another great overall recording platform, similar in quality and intent to Logic Pro and Adobe Audition, and mostly optimized to produce music. For podcasters, there is a learning curve. Just leave me a comment if you think there are other innovative platforms I am missing at the time of this writing.